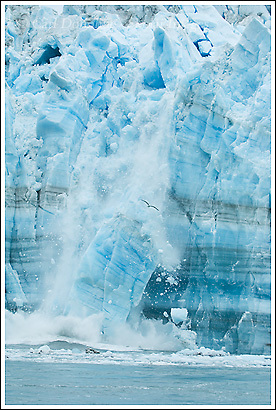 Hubbard Glacier calving photos, Gilbert Point, Russell Fjord, Alaska. Mark knows his stuff. 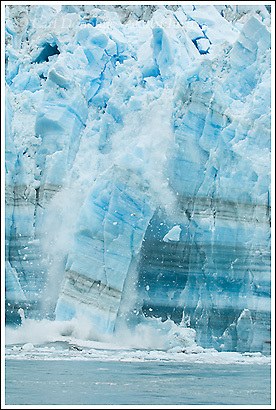 I’d never have got this photo of the Hubbard Glacier calving without his knowledge. He looked at the wall and said ‘that’s gunna go, soon’ .. so we waited. And sure enough, a few small pieces of ice started to fall. I shot a bit, and few more started to fall. I shot a bit more. Thinking ‘that was cool’, I started to ease up. Mark says “get ready”. I’m smart enough to know he knows what’s up, so I get ready; seconds later this huge wall lets go. This wall is approx 150′ high. To witness such a blast was amazing. I got some nice shots of the wall falling, then the camera lost focus in the splash – the autofocus just couldn’t grab onto anything, and I was too useless to do anything about it. ‘wow, that was cool’, I said – watching the waves start to build up. ‘We need to get outta here’, says Mark, and he races to start the boat. This wave about 10′ high surges from the scene of the calving ice, and Mark starts the boat and races off into the fjord, just in time. The wave would surely have landed us on the beach. Then we turned back and watched it all happen again. 3 times in maybe 30 minutes. As I said in another post, if you go to Yakutat, ya gotta go see the Hubbard Glacier. This entry was posted in Alaska, Landscapes, Travel, Wrangell - St. Elias National Park on July 15, 2008 by Carl D.
That is a sight to see. I’m glad he started the boat and you got out of there. The wave off something that big, the whole face may have swamped your boat or worse, capsized it. That’s an awesome pic. Great work, and fun ,too! P.S. If you’re in Yakutat, look for the elusive Blue Glacier Bear. What a wonderful & rare pic that would be! They’ve been spotted in Yakutat, coming out on the beach right around dusk.